I was looking through photos on my Facebook page, and they brought up memories. Some awful, some hilarious (in an embarrassing kinda way) some amazing. One particular memory was the launch night of my exhibition in 2009 ‘Saints and Sinners’. Saints and Sinners was probably one of the most important moments in my career and the best experience I have ever had in my life. Everything about it from the initial idea, to meeting the sitters and to the opening night. I adore religious art and had always wanted an excuse to paint like the wonderful Caravaggio (and others), in the Baroque style with a Homan twist. Saints and Sinners was conceived while I was at the gym, it was one of those eureka moments and everything stopped. I dropped my weights and left the gym consumed by the idea of it. I brainstormed and researched for days till I was drawing up endless mind maps. 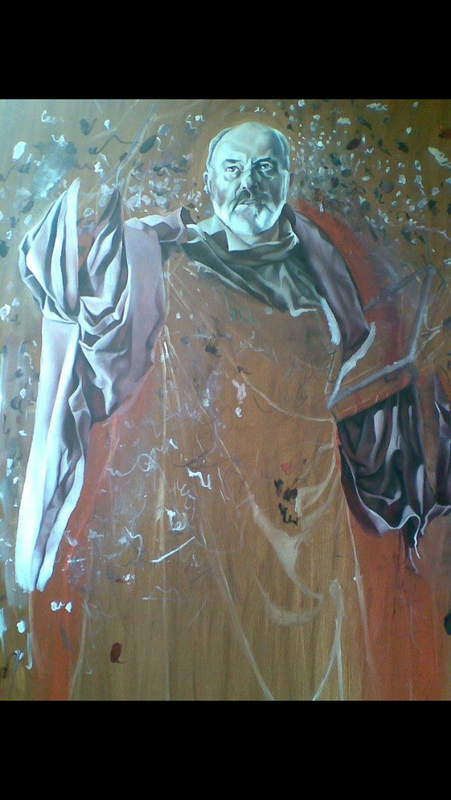 My idea was to match well known Irish personalities – celebrities if you will, to saints and paint them as thus. For example, Graham Norton is famous for his talk show, and presenting (among other things), Archangel Gabriel is patron to TV presenters and broadcasters so I matched them up with each other. Brendan Courtney is a stylist and fashion designer so I matched Saint Paul the Hermit with him as he is patron to the fashion industry. If I couldn’t find a match to their profession then I would pick a saint that was close to their name or personality. I included symbols that would represent both the celebrity and the Saint. 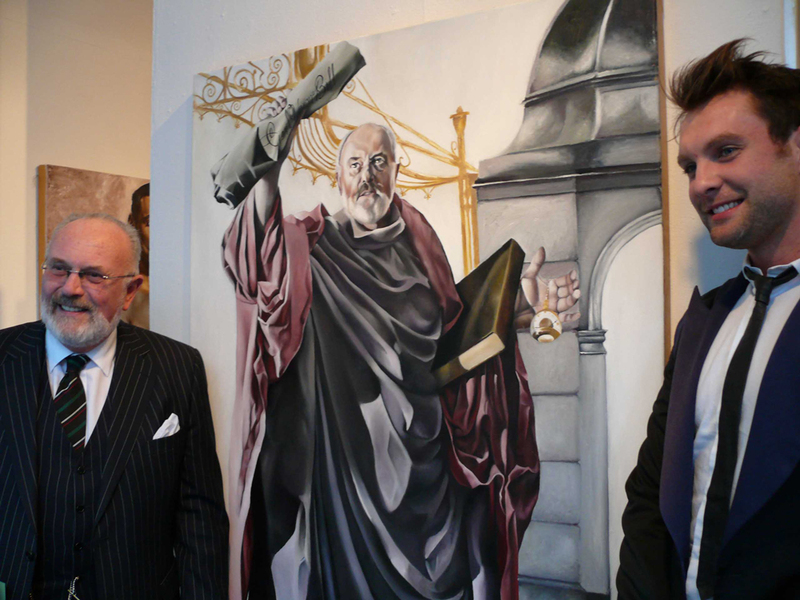 For example, Saint Peter; I asked the amazing Senator David Norris if he would be him, David thankfully jumped at my idea and thought it was amazing (I know I am blowing my own trumpet, but the validation from David was everything, he is a personal hero of mine to boot). 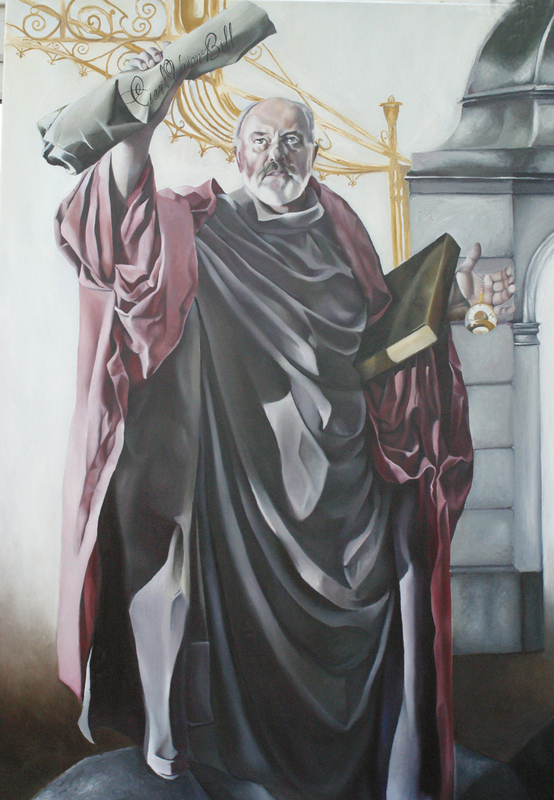 With this painting I included the watch David always wears on his three piece suit- Saint Peter holds patronage to clockmakers, David was standing on a rock- Peter means rock, David was also holding a book which can be represented as Ulysses or the bible. I’ll never forget going to meet him, It was a Friday morning I didn’t sleep the night before. On the way into town I had to get off the bus and find a café I could get sick in because I was so nervous. I realised I had one hell of a journey ahead of me and I couldn’t do it on my own. I asked a friend of mine if he could help me and he thankfully agreed. I don’t think the poor guy knew what he got himself in for. The panicked phone calls, the emails that he couldn’t read properly due to my dyslexia and lack of spell check and the temper tantrums he had to talk and occasionally scream me out of. With each celebrity agreeing to sit for me I had to constantly pinch myself. I couldn’t believe I came up the idea let alone had all these brilliant people agree to sit for me and be so on board with the project. I think from the initial email I sent they didn’t think I was for real but after sharing the proposal and images of what I hoped to portray for each individual one of them, they were quickly on board. I started the first painting of the series on the 6th January 2008, 7 months after extensive research. 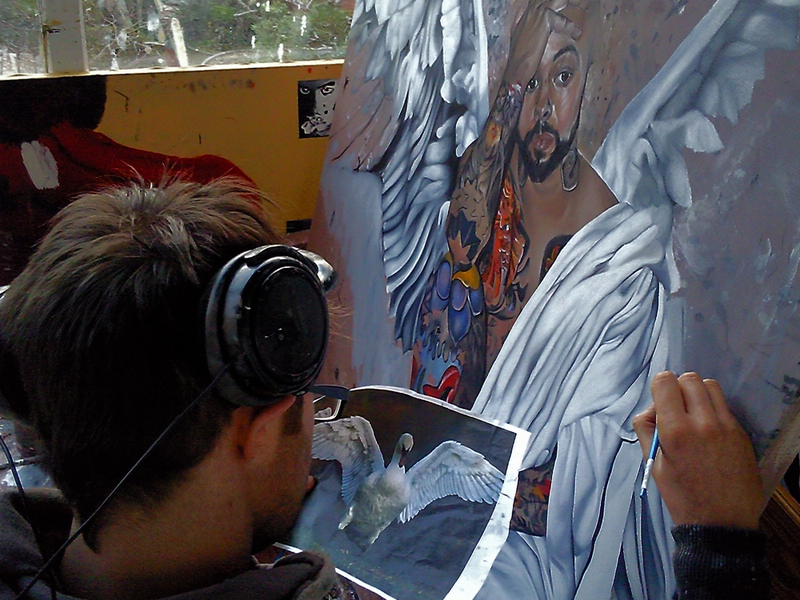 The first painting was of the wonderful Derrick Carburry, who I was painting as Saint Luke. Saint Luke holds patronage to artists; Derrick is an amazing make-up artist. I’ll never forget sitting in my studio procrastinating the first brush stroke, a white canvas can be the most intimidating thing to an artist. I was telling a friend of mine how I hated the white canvas, he taught me a technique that quickly ended the intimidation and got me over myself. Each painting took me about a month to do, and with every painting it got easier and easier, I used to hate taking a day off as I would miss it so much. I used to paint into the wee hours in my bedroom (I couldn’t afford a studio at the time so my bedroom quickly became my studio) with a bottle of wine and some Chet Backer to keep me company. Each painting spiralled me into my own little world. It was heaven. After 17 months of painting the exhibition and launch night became a reality, it was in the FilmBase in Templebar, Dublin on the 9th of April. After two years of work, tears, tantrums and memories that I couldn’t pay for, 13 of my paintings were hanging on blank white walls for the world to see. I had given birth to ‘Saints and Sinners’. I went to a friend with the idea asking if there was any advice he could offer me in regards to the project. Thankfully enough he had and he came on board with me from the beginning to the end. While I was working out I was thinking about religion, Catholicism, and its relationship to art and its devoted followers. How throughout history the church has influenced people through its teachings, dare I say even brainwashed some of them. In 2007, when I first sat down to research the project, the Civil Union Bill was in heated debate in the Dail. In Ireland the Church and State come hand in hand. It brought me back to the bible and how the bible views certain groups of people, such as homosexuals. I remember as a kid in bible studies and religion class in school reading about ‘thou shall not lie with another man’ etc and how scared I was to ‘come out’ and own my sexuality. It took me a good while to be comfortable with the fact that I was a gay man and reading stuff like that and remembering it did not help. At the time all I wanted was reassurance from a god as such for reassurance. All of this thinking led me to statistics and how statistically 1 in 10 men are gay, therefore throughout the history of the Catholic Church, the biblical times, Anno Domini, there has to have been 100s and thousands of religious gay men, popes, priests, canons, etc therefore the bible and its teachings on homosexuality is hypocritical. They have canonised millions of people as saints, everything has a patronage to a saint. I thought one of these guys has to be gay. I then thought of an Irish celebrity or a well known Irish personality and tried to link up a saint to their patronage.